The proposal calls for building a three-story, 40,786-square-foot addition to connect two existing buildings at 3161 and 3169 Research Park Drive, which are owned and occupied by the nonprofit. According to a staff report, the additional space will accommodate offices, a special events auditorium and “organ procurement suites.” The nonprofit’s website states that the Gift of Life is Michigan’s only federally designated organ and tissue recovery program. Cost of the expansion project will be $10.5 million. 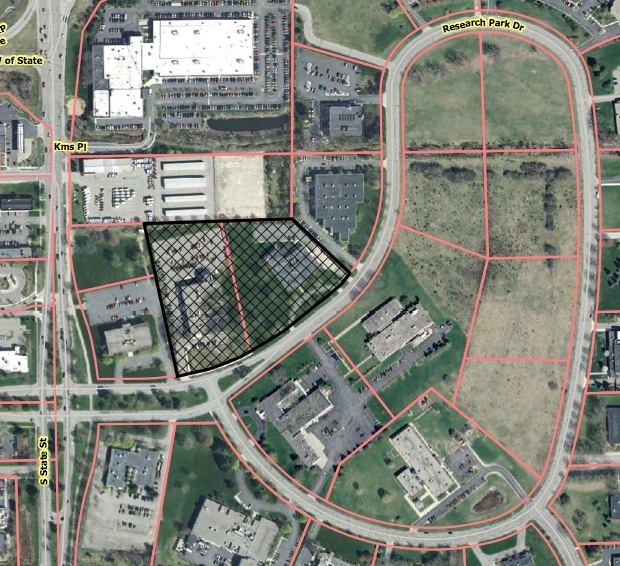 The city planning commission recommended approval of the rezoning at its July 1, 2014 meeting. City council action came at its meeting on Aug. 7. Only the initial consideration of the rezoning was on the Aug. 7 city council agenda. Rezoning requires two council votes taken at separate meetings. The changes would rezone the properties from office (O) and research (RE) to office/research/limited industrial (ORL). The parcel at 3161 Research Park Drive is currently zoned O. The parcel at 3169 Research Park is zoned RE. The plan is to combine those lots before the city issues building permits.